Geminid Meteor Shower 2018: It's Not Too Late to Catch a 'Shooting Star'! The Geminid meteor shower lit up the sky over Saltburn By The Sea, United Kingdom, on Dec. 14, 2018. The Geminid meteor shower has already peaked — but you still have time to try to catch sight of what will likely be the best meteor shower of the year. Earth flew through the densest patch of debris streaming off asteroid 3200 Phaethon early on Dec. 14, but the couple of days that remain to view the shower could still offer an enchanting spectacle. You can see amazing photos of the 2018 Geminids here. When you're ready to head out, don't forget to bundle up. It is winter, and you will be outside, unmoving, for at least half an hour, likely longer. You'll be better off without binoculars or a telescope, anyway, so don't forget to wear gloves or mittens. 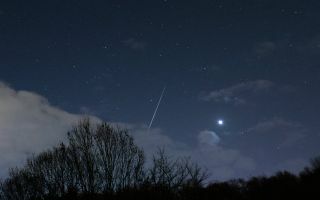 The 2018 Geminids have dazzled spectators who managed to see it during the peak. Shen Zhang of Sunnyvale, California sent in one photo of a brilliant meteor as it streaked across the night sky over the the Bay Area around San Francisco. The 2018 Geminid meteor shower, as seen from Sunnyvale, California. In an email to Space.com, Zhang reported seeing between 20 and 30 meteors at about 9 p.m. PST at Skyline Ridge Preserve in nearby Los Altos. "It was a little cloudy, but [I was] lucky enough to capture one shooting star using my camera," Zhang said. If you have a reclining lawn chair on hand, bringing it will make your skywatching experience more comfortable. To reduce the interference the moon's light causes, angle yourself so it's toward your back,t or wait until the very early morning, when the moon has already set. Then, all that's left to do is wait. Your eyes will likely need about 20 minutes to adjust to the deep darkness, so settle in and give them the time they need. If you're patient and lucky, the Geminids will dance before your eyes. Editor's note: If you snap an amazing photo of the 2018 Geminid meteor shower or Comet 46P/Wirtanen that you'd like to share with Space.com and our news partners for a possible story or image gallery, send comments and images in to: spacephotos@space.com.